Obituary – Sewell, John Harold « Perry High School Alumni Association, Inc.
Excelsior ’20, Football cpn. ’19, Glee Club ’20. John H. Sewell, 89, Norman, recently of the Perry community, died at 7:30 p.m. Saturday at Norman Regional Medical Center. Funeral will be at 2 p.m. Tuesday at the chapel of Brown Funeral home. Rev. Allen McHam, pastor of the First Baptist church of Perry, will officiate. Burial will be at Grace Hill cemetery. Memorials may be made to the John H. Sewell Pharmacy Scholarship in care of the Exchange Bank & Trust Co. of Perry. 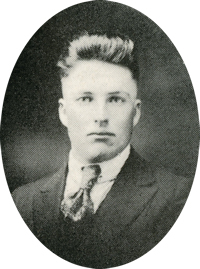 Sewell was born Oct. 8, 1899, at Hallett, the son of John M. and Wynona Sewell. He moved to the Perry area in 1906. Sewell was a graduate of Perry high school and the University of Oklahoma. He was married to the former Zola Stanfield, who survives. Sewell owned and operated a pharmacy at Buffalo from 1930-1951. He and Mrs. Sewell then moved to the Perry community where he was engaged in farming and worked at local pharmacies. He was a member of the Baptist church. In addition to Mrs. Sewell, of the home at Norman, survivors include two daughters, Mrs. Terry (Thelia) Shaw, Norman; and Mrs. Gerald (Julia) Payne, Perry; seven grandchildren and nine great-grandchildren.